OK, it may have been so long that you don’t even remember. So let me help you catch up and be excited with me. 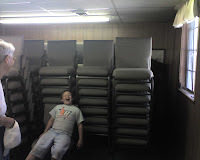 Last summer we started talking about selling our pews and ordering chairs to replace them. We posted them on www.usedpews.org and received lots and lots of inquiries – but no bites. One of those inquiries (within a month of being posted) was from a church in Haslet, Texas, which is adding a new building to their church. After many delays (and one false hope), they contacted us again this spring, and we finally got to meet one of their people. Mark flew up here on April 5 to take pictures and inspect the pews. He was impressed and thought that they would be able to buy them. We were to know in a few weeks. 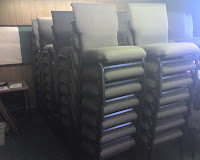 On April 26 we received payment for the 27 pews they bought (BTW–we still have 11 to sell). They said they would have a truck here toward the end of May to get them. But their building was delayed. Some unexpected events caused them to push back 3-4 weeks. At last word they expect to come retrieve the pews this week or next. So all this time, we thought that there would be several weeks during which we had no (or rough) seating. Instead, we have twice what the auditorium will hold!